Nancy seeing you here! 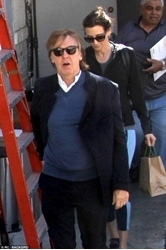 Sir Paul McCartney, 75, and Shevell, 58, make low-key exit out the back ... . Beatles Radio: The Beatles, Solos, Covers, Birthdays, News The Fab 4 and More! They have been madly in love for more than a decade. And keeping the romance alive, 75-year-old Paul McCartney enjoyed an intimate lunch with Nancy Shevel, 58, on Tuesday in Beverly Hills. The casually-clad rocker shielded his eyes with a pair of sunglasses as he made a low-key exit from the eatery ahead of his wife.Read more:The casually-clad rocker shielded his eyes with a pair of sunglasses as he made a low-key exit from the eatery ahead of his wife. Meanwhile, Nancy cut a casual figure in a dark hoodie and cut-off trousers which she teamed with trainers for their afternoon date. The wife of the musician displayed her natural age-defying beauty when she scraped her brunette tresses into a bun and shielded her eyes with sunglasses.